Ideally, WhatsApp – the latest update – is 89.3 MB in size. However, I’ll be willing to wager that it occupies more on every device owing to the massive amount of documents and data it saves such as videos and pictures. On my iPhone, it’s currently occupying 317.4 MB even after recent cleaning and rises close to 1 GB for others who receive massive amounts of videos and multimedia files. And the fact that users have to manually delete files from individual files makes this a serious issue for iPhone users not only from a storage space perspective, but from a performance perspective. For this reason, a new market for WhatsApp cleaners for iPhone has opened up. This article reviews a few. This multi-functional iMyFone WhatsApp cleaner for iPhone is packed with the latest technology and functions as both a space-freeing and performance-boosting app. 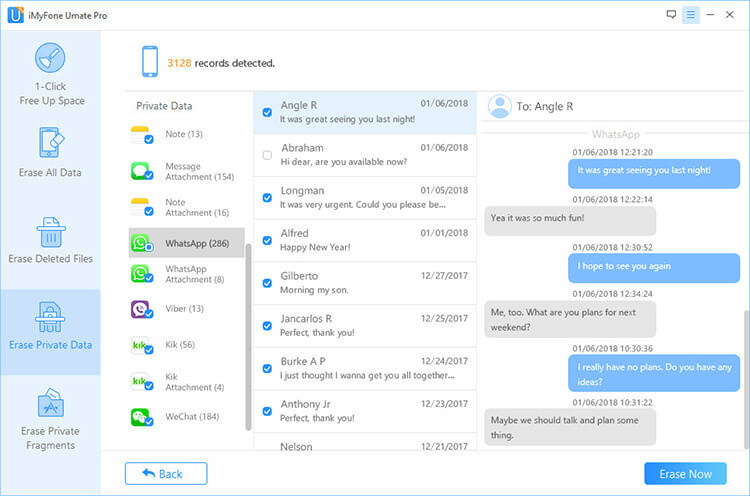 Backed by over 25 data analysis technology, the application searches the nook and cranny of your storage space to unearth files you don’t need such as files stuck inside WhatsApp. Permanently erase private WhatsApp messages, photos, videos, attachments, etc., which is 100% unrecoverable. Scan and completely destroy previously deleted WhatsApp files which are still recoverable. 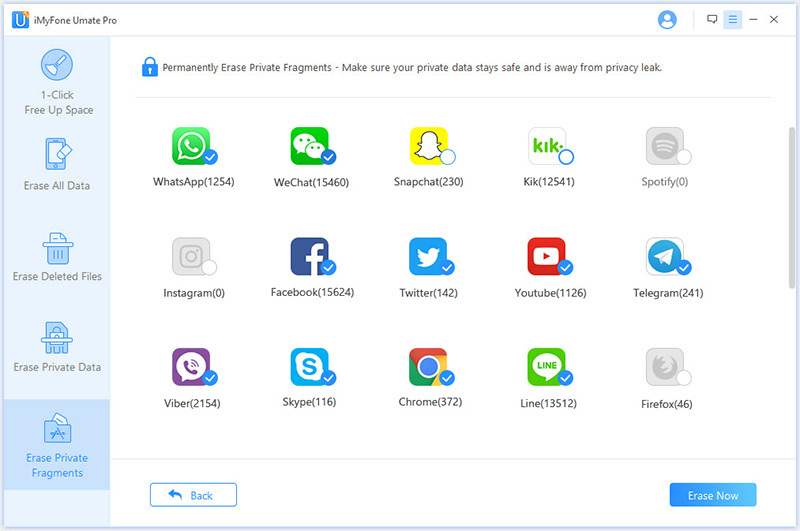 Fully wipe WhatsApp traces and fragments to protect your privacy. Also support to clean WeChat, LINE, Viber, Kik, Snapchat, etc. 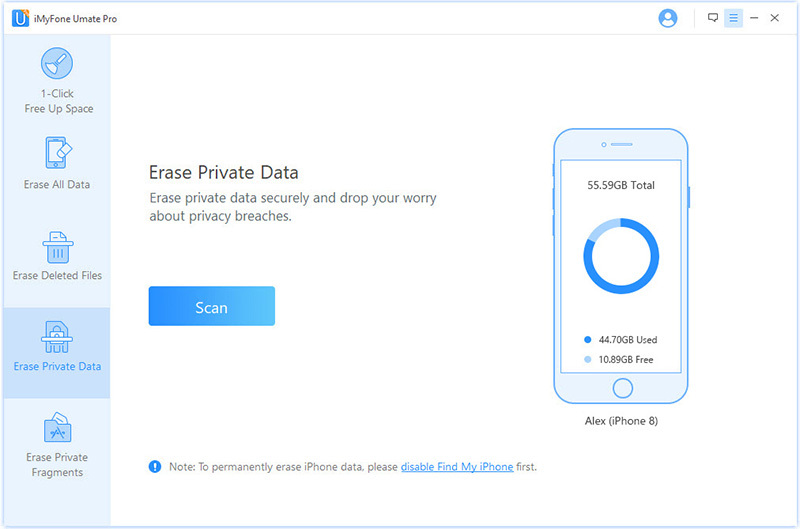 This cleaner primarily only caters for deletion of junk files from iPhone devices including system settings, pictures, and contacts. The app works well with all versions of the iPhone, iPod Touch, and the iPad. 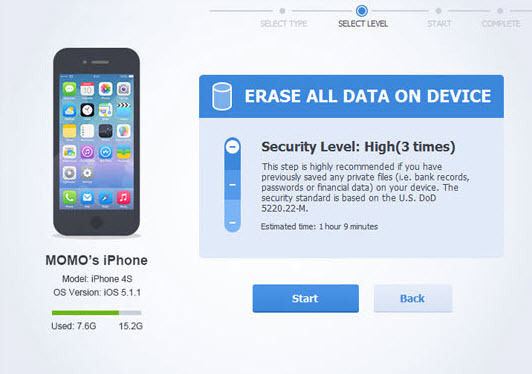 The app comes with different types of deletion: ‘low’, ‘medium’, and ‘high level’. The low level clears data very quickly; the medium level clears currently existing and deleted files, while the high level is for removing private info such as account passwords and other personal details. This app clears out WhatsApp history in addition to clearing other junk files such as cookies, bookmarks, browsing history, and similar files. The app is lean and created to do the aforementioned only. Additionally, the app works in a read-only mode, which makes sure there are no data losses or any damage to the device during the cleaning process. From the table, it's easy to find that iMyFone WhatsApp Cleaner is the most useful one as the other two cleaners don't have the complete functions. That's why most WhatsApp users choose it. Step 1: Download the iMyFone Umate Pro installation file to your PC or Mac. Locate the file and double-click to run the file. Step 2: Once it’s done installing, launch the program and connect your device. Step 3: To erase WhatsApp files, select "Erase Private Data", "Erase Deleted Files" or "Erase Private Fragments" option. Let it scan your iPhone. Step 4: Preview and select the "WhatsApp" or "WhatsApp Attachments". 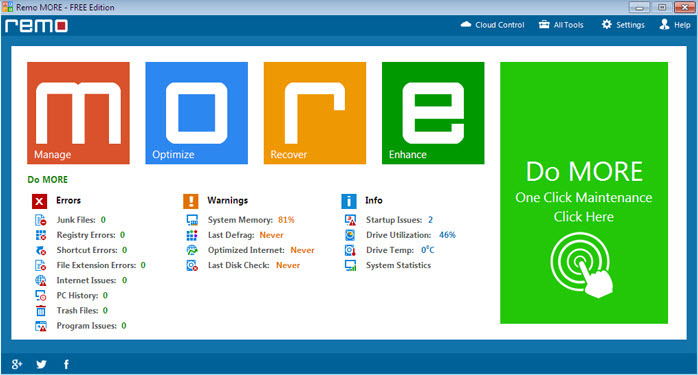 Step 5: Click on “Erase Now” and confirm the operation. Why Data Should Not Be Recoverable? Privacy is a big issue as far as the internet and its usage are concerned. Despite its many benefits, a few nefarious people are always out to take advantage of loopholes including maximizing privacy risks as a result of WhatsApp usage. For this reasons, data or information that can cause serious harm must be deleted. This deletion must be done such that these files can never be recovered no matter the recovery tool used. This way, you can keep your privacy safe and avoid undesirable outcomes.